Please note: ESPN Zone in the Downtown Disney District has closed to make way for a new hotel coming to Disneyland Resort. Where sports fans rule! 175 flat-screen televisions welcome hungry fans as they catch every moment of that action-packed game. Sports bar standards like burgers, wings, and fries highlight the menu during lunch and dinner hours. Make sure to save some energy for the 10,000 square-foot arcade upstairs that features state-of-the-art gaming experiences, classic video games, and lots of action-packed fun. 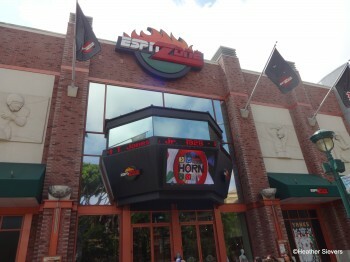 Show your spirit with merchandise from the ESPN Zone Studio Store! You’ll find unique sports-related collectibles, jerseys, and memorabilia.